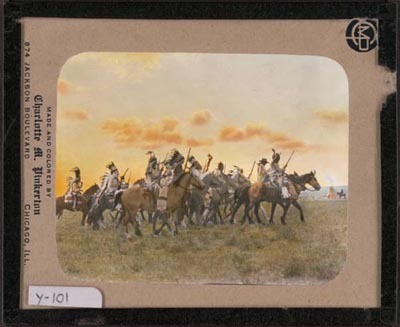 Thousands of photographs of the Blackfoot and their homelands in northwestern Montana. Pittsburgh native Walter McClintock graduated from Yale in 1891. In 1896 he traveled west as a photographer for a federal commission investigating national forests. McClintock became friends with the expedition’s Blackfoot Indian scout, William Jackson or Siksikakoan. When the commission completed its field work, Jackson introduced McClintock to the Blackfoot community of northwestern Montana. Over the next twenty years, supported by the Blackfoot elder Mad Wolf, McClintock made several thousand photographs of the Blackfoot, their homelands, their material culture, and their ceremonies. Like his contemporary, the photographer Edward Curtis, McClintock believed that Indian communities were undergoing swift, dramatic transformations that might obliterate their traditional culture. He sought to create a record of a life-way that might disappear. He wrote books, mounted photographic exhibitions, and delivered numerous public lectures about the Blackfoot.